MOMA Machynlleth at Y Tabernacl01654 703355work Exhibition CentreThe Tabernacle was converted in the mid-1980s from a Wesleyan chapel into a centre for the performing arts. Since then MOMA MACHYNLLETH has grown up alongside it in seven beautiful exhibition spaces and throughout the year MOMA MACHYNLLETH shows Modern Welsh Art, in a series of constantly changing exhibitions featuring Wales’ top artists. Since The Tabernacle opened in 1986 the Trust has built up a Permanent Collection of works by artists from 1900 with the emphasis on artists living or working in Wales. 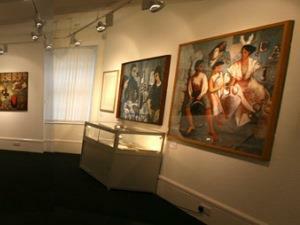 The Trust’s policy has been to acquire works from exhibitions in MOMA MACHYNLLETH. Currently there are over 280 works in the collection which is regularly exhibited as part of the exhibition programme. Works from the growing Tabernacle Collection are shown in rotation. In July every year artists are invited to enter a new work in the Tabernacle Art Competition. Expert judges and then the public choose the winners. The Auditorium of The Tabernacle has perfect acoustics and pitch-pine pews to seat 350 people. It is ideal for chamber and choral music, drama, lectures and conferences. A fine Steinway grand piano has been purchased. Translation booths, recording facilities and a cinema-screen have been installed; the oak-beamed Foyer has a bar; and extensive access for the disabled has been made possible by a lift. The Machynlleth Festival takes place in the Auditorium in late August every year. During the week eminent performers take part in a wide range of events, from choral singing and jazz to chamber music and poetry readings. Special features are the Hallstatt Lecture on some aspect of Celtic culture and the Glyndwr Award for an Outstanding Contribution to the Arts in Wales. The Tabernacle was converted in the mid-1980s from a Wesleyan chapel into a centre for the performing arts. Since then MOMA MACHYNLLETH has grown up alongside it in seven beautiful exhibition spaces and throughout the year MOMA MACHYNLLETH shows Modern Welsh Art, in a series of constantly changing exhibitions featuring Wales’ top artists. For the rest of the year the centre can be hired for performances, rehearsals and gatherings. Ty Llyfnant houses music teaching rooms and an art studio while the Green Room doubles as a lecture room where Lifelong Learning classes are held. Superb self-catering accommodation for up to four people can be found at walking distance in the New Barn within Royal House.